As I mentioned before, I’ve been on a real alternative fibre kick. It all started with some Rowan Creative Linen and it’s really just expanded from there. I don’t know if it’s just being around the shop and having the chance to peruse/feel/obsess about all the different fibres but I am hooked. While this kick seems to have started small, it’s quickly expanding and I’ve been eying the Qiviuk yarn on a daily basis. Qiviuk is a rare and interesting fibre to say the least. It’s made from the downy undercoat of the Muskox in the Canadian Arctic. The Muskox aren’t likely to let someone shear their coat (plus they really need it in the far north) so their down is collected from branches and underbrush after the herds have passed. 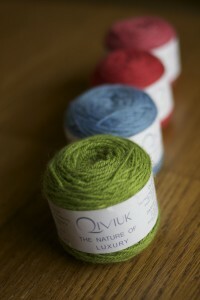 The blend we carry is 15% qiviuk, 80% merino, and 5%mulberry silk. Each little 28 gram cake has 145 yards of a lace weight yarn. Pick yourself up a little treat! This entry was posted on Monday, March 12th, 2012 at 12:12 am	and is filed under Uncategorized. You can follow any responses to this entry through the RSS 2.0 feed. Both comments and pings are currently closed.